By default Google Chrome version 4.0 or better is configured to support the Bulk Action feature. Be aware of commercial and free ad-blocking plugin software for Chrome. Some ad blocking plugins will prevent sites from using DOM storage. 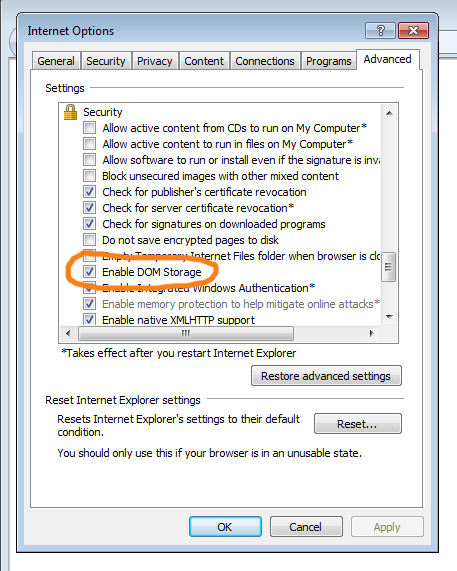 If you are using Chrome and you see the HTML5localStorage warning message, try disabling your browser plugins and revisit TelVue Connect. double click on the row and it should be set back to “true”. Restart Firefox and visit TelVue Connect again. Click “OK” and restart Internet Explorer. Visit TelVue Connect again. Certain privacy enhancement and ad-blocking browser plugins can interfere with TelVue Connect’s Bulk Action feature by preventing TelVue Connect from writing data to your browser’s local DOM Storage. If you are using a supported browser and still see the localStorage warning, please try turning off your browser plugins.